In my previous post, I discussed how you could push down a script to a Mac to clean up the LANDESK SDCache folder, potentially recovering precious hard drive space. This script process described previously, while quick and efficient, is more of a band-aid and doesn’t necessarily address the problem of binaries being kept too long on the Mac – especially those with super small hard drives. While having an SDCache folder full of binaries can be helpful, especially on bandwidth constrained networks as other clients can pull directly from that local Mac as opposed to the source file share, you may find you just need to shorten the number of days some of your Macs keep files within the SDCache folder to save yourself the headaches from the help desk calls complaining that their machine is out of hard drive space. The XML file that controls the schedule for the SDCache purge is located in the /Library/Application Support/LANDesk/scheduler folder and is titled ldcron-sdclean.xml. If you crack that file open with a text editor, you’ll notice it contains the same command line text we used to purge the SDCache folder manually. All you need to do is copy off the ldcron-sdclean.xml file from one of your machines or download an example from my GitHub repository, and adjust the -mtime +45 to align with your needs. Setting a value of +10 will tell LANDESK to purge any file within the SDCache folder older than 10 days, +3 would purge any file older than 3 days and so on. So set the appropriate value, using your favorite text editor, and then save the updated file to one of your file repository shares. Now we need to create a Mac package to deploy out the updated ldcron-sdclean.xml file to all of the Macs that need to be updated. I’ve written a script, again available on my GitHub page, titled changeSDCachePurgeTime.sh that will do exactly that. 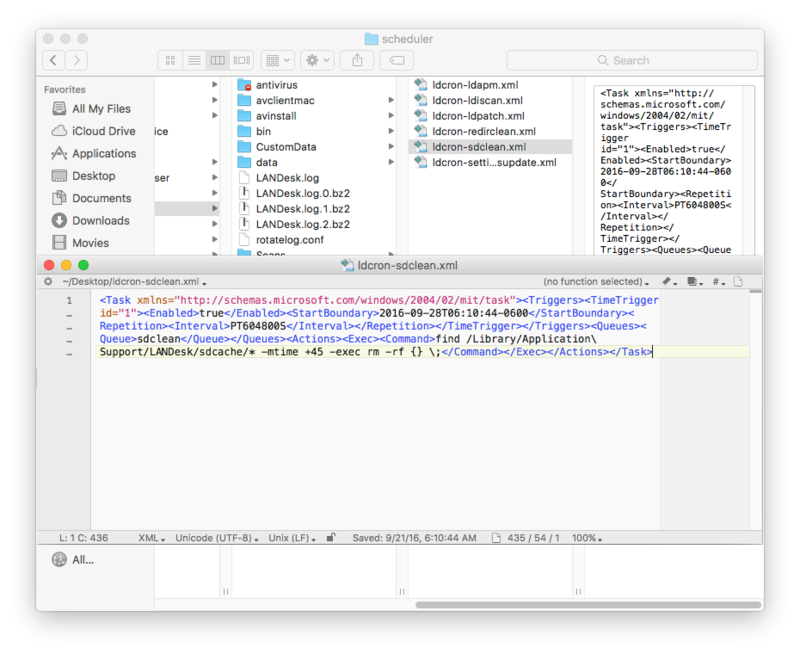 Basically, it uses the LANDESK sdclient tool to download the XML file and place it into the /Library/Application Support/LANDesk/scheduler folder. In order for you to use the script, you just need to change the fileToCopy variable path to match the location you saved your ldcron-sdclean.xml file to. Other than that, it should be totally ready to go. # Created by Bennett Norton on 9/21/16. /Library/Application\ Support/LANDesk/bin/sdclient -noinstall -package "$fileToCopy" -destdir "$destinationLocation"
If you decide to write your own script, just make sure you set the execute permissions on the file prior to copying it to your file share. Now you’re ready to create your Mac package and deploy. The directions to so do are below. Well, not quite. If at any time in the future you redeploy the LANDESK Mac agent, the ldcron-scheduler.xml file will be overwritten with the default +45 day value. You could always write a custom definition, if you’re a LANDESK Patch customer, and watch for that value and remediate if detected. However, that may be more work than its worth to you, if you only have a couple of machines you’re concerned about. So just be cognizant that an agent deployment will reset the value and redeploy your package if need be. In part 6 of the LANDESK Mac Management video series, I discuss how to use a freeware utility called CreateOSXInstallPkg, available at https://github.com/munki/createOSXinstallPkg, to build an upgrade package that can be easily deployed with LANDESK Management Suite 2016. While this can be done as a required package, this video will walk through the process using Workspaces; focussing in on the end user experience via a self-guided upgrade. In part 5 of this LANDESK Mac Management series, we’ll use Apple’s FileVault and a LANDESK Security Suite license to enable encryption on the hard drive as well as to collect the individual recovery key from the machine; storing that key in a unique database table on the core server independent from the computer record. Note: This feature is only enabled with a LANDESK Security Suite license. In part 4 of this LANDESK Mac Management series, we’ll demonstrate how you can patch the Mac OS, walking through the reboot process as well as patching 3rd party application titles on the machine; which typically don’t require a reboot to take place. I’ve decided to record a number of videos in a little mini-series of how to do Mac Management using LANDESK Management Suite and Security Suite 2016. Today’s release discusses how you can build a LANDESK Mac agent. The video also covers how to configure a client so you can push the agent to the device. Lastly, the video addresses how to manually install the agent in case you don’t have SSH or Remote Login access.